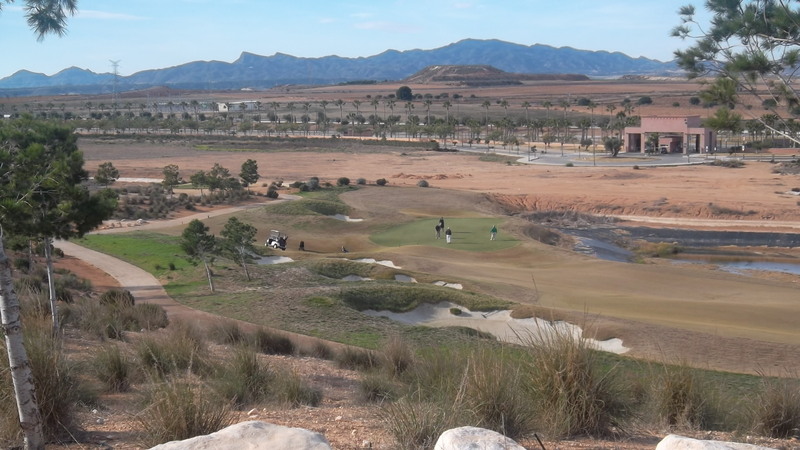 Some more good news for Murcia – a feature in Today’s Golfer Magazine March issue (due out 1st week of Feb). Continental Europe’s Best Value Destination was Murcia Spain. “You really do get value-for-money in this part of the golfing world. Indeed Murcia is now giving the Costa Del Sol, which finished fifth, a good run for its money as a major golfing destination and it’s fair to say it has established itself as Spain’s fastest growing destination”. There has been a society at Condado since January 2010 which is available to residents, renters and guests staying with residents. The cost of this is 5€ per year and new members are expected to provide details of the apartment number, home club and current handicap. If you cannot provide evidence of handicap you will need to play off 18 handicap until 3 individual stableford scores at Condado are submitted. Society handicaps are adjusted after each individual competition. Even with proof of handicap and club you cannot win one of our major events until one individual stableford card has been submitted. 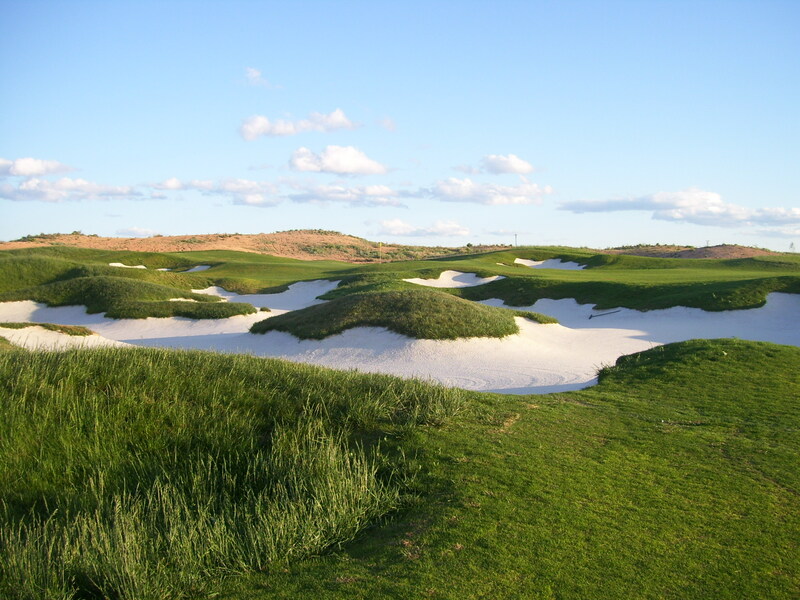 Reduced green fees when playing on a society time (at the moment Monday, Wednesday Friday in a 2 hour morning slot). Friday is a formal competition, other days not so. Currently this costs 40€ (45€ with shared buggy). This is a saving on residents fees which are 51€ and 28€ for a buggy. So on the first round as a member you will save at least 11€ and maybe 20€ with buggy for your 5€ investment. Start times for all events are posted in the clubhouse – just add your name. If you are not on site you can book in advance at bookings@cdagolf.com so you will have partners organised when necessary. Entry to competitions costs 2€ and all entry fees collected are paid out in prizes. From society funds we also give out 4/5 prizes in the free draw for non-winners who attend at the Clover. Neil & Lynn also provide a wide selection of sandwiches for golfers and families free of charge. Every member also receives a free diary/fixture list which they can collect at the Clover bar. 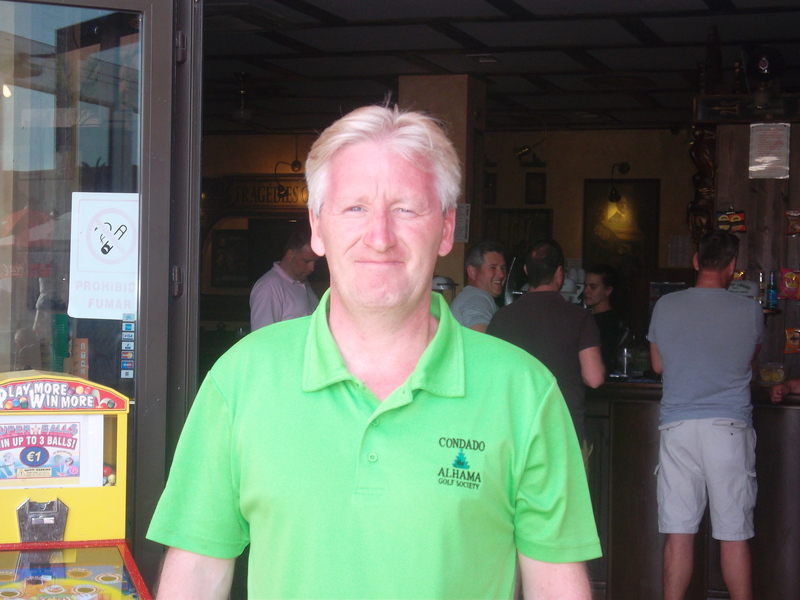 We also supply society polo shirts at the very competitive cost of 15€. The colour changes each year and for 2014 they are plum. Several times a year we have an evening presentation at a local venue for major competition presentations where all are welcome to enjoy the social side of the society. This usually includes a meal and live entertainment for a reasonable cost. Thanks to Neil and Lynn we have a magnificent trophy cabinet which is a spectacular showcase for our many trophies (in the Clover). 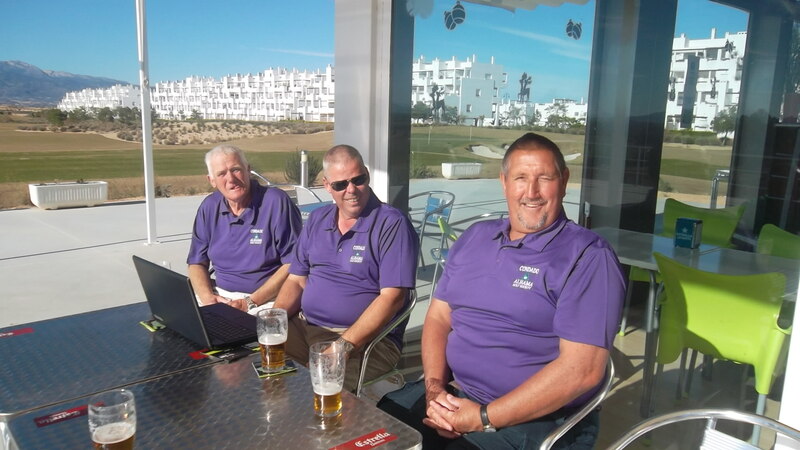 The society have a weekly blog (www.cdagolf.com) which gives competition results news, photos and videos so you can keep in touch with what is happening when you are not on site at Condado. A full history of society competitions and events is available on the site. 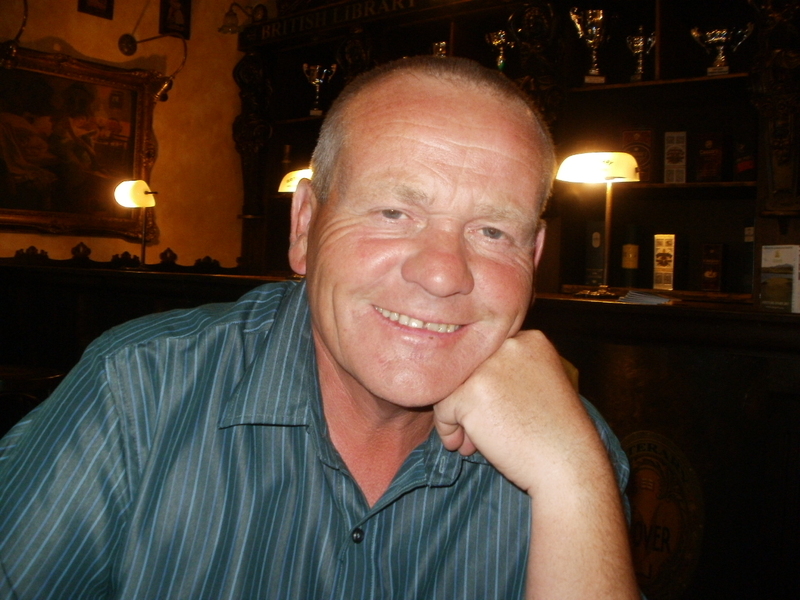 The big sing off………Tom Jones eat your heart out!……………..
Dave Lloyd has always had a monopoly on the song Delilah………..well maybe that welsh lad Ton Jones had a go at it too. See Dave and his backing group at the Condado Club last summer. But I think he was stood on a cats tail during the show! We had a go and sang it better? (or with less pain for the audience?). It was certainly different with new words…….Golf theme rather than jewish temptress with my, my, my, crap driver replacing why, why, why, Delilah! New lyrics completely, Gary Barlow eat your heart out too! Maybe the audience reaction (Dave’s groupies) at Los Balcones on Ladies day suggests that they prefer Dave’s version? But there was not a lot to beat was there? a winter view of the 4th green……..
Friday was a beautiful day to play golf with warm sunshine for the 36 players. It was a pairs aggregate where both players points at each hole were added. 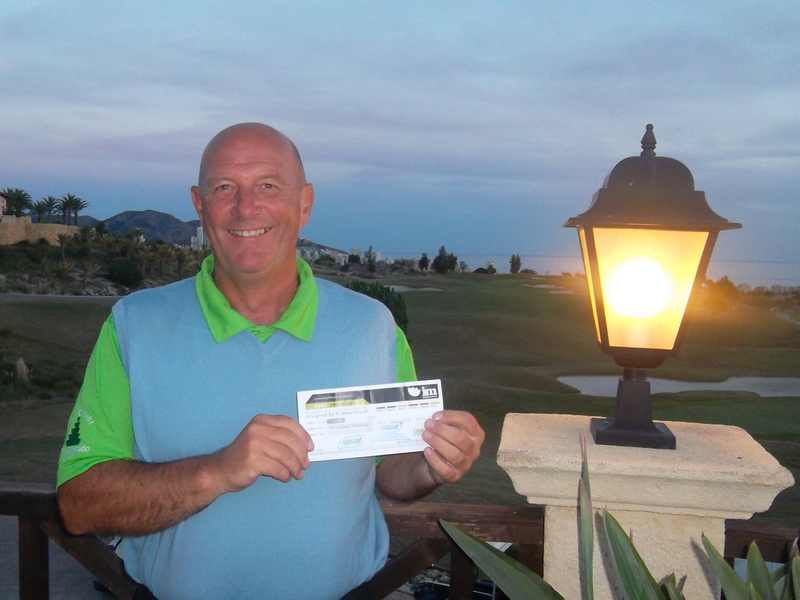 With all scores being recorded it was also a qualifier for handicap purposes. Also a reminder that we are looking for a new social secretary to replace Cath, who has done such a great job arranging entertainment and transport for members at evening presentations. Regarding local deals for golf some members have tried Camposol which is only 20€ or 25€ with buggy. 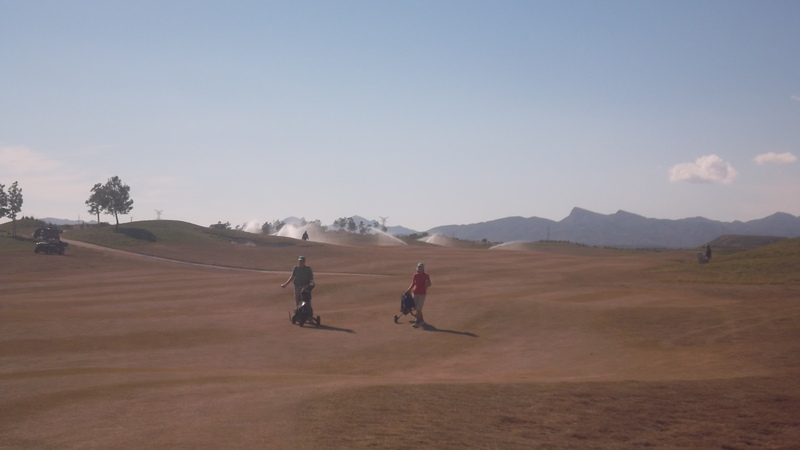 We went to Aguilon last week and had a great day with excellent service for 38€ with buggy. However it cost Peter Reeves considerably more to replace his lost balls! 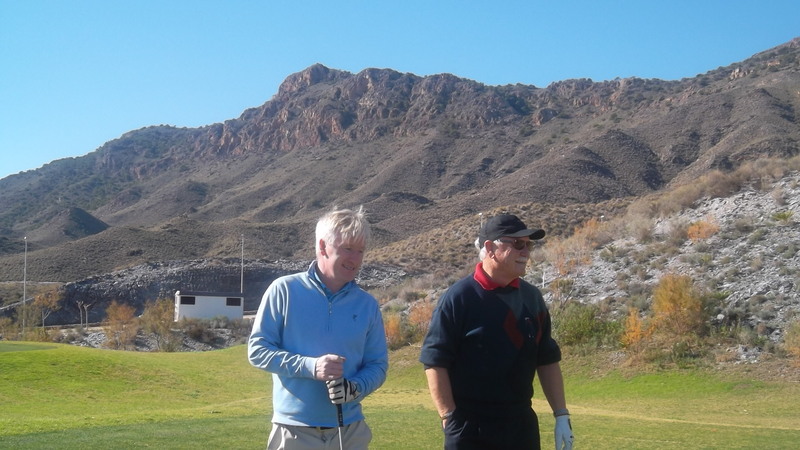 Pat Hughes and Peter Mitchell are surrounded by spectacular mountain views at Aguilon……. Next week is a 4 person texas scramble and the following week is the Anniversary trophy (pairs drawn out). Each week at the presentation in the Clover we give away several prizes for non-winners – a card draw takes place but you must be present to win. This week we had gin, wine, jewellery and hip flask with JD. Come on down at 5.45pm at the Clover on Fridays. Below you can see the new plum coloured society shirts for 2014. You can get these from Kev at only 15€. As you can see, they come in all sizes! you can breath out now Les!………. Not much to report this week so I have added a few pictures and a video – just seeing if I could actually do it! The next efforts might be a bit more professional and interesting . It is nice though to see some live views of the course for those who are struggling with terrible weather back in the UK & Scandinavia. 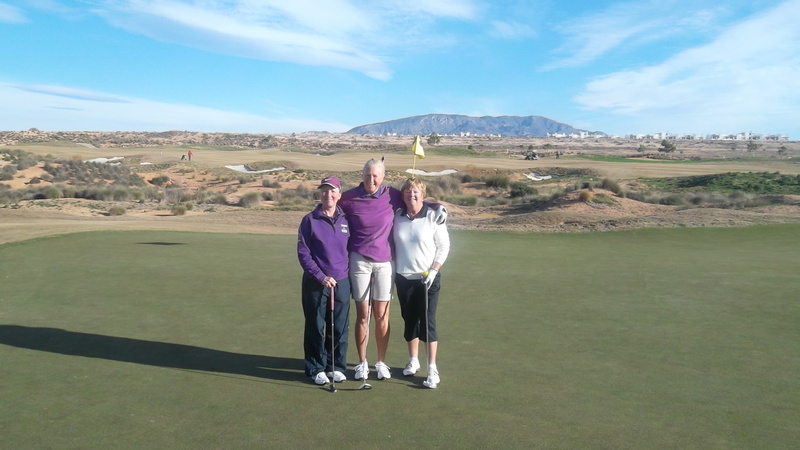 Kim, Alicia and Dorothy on the 3rd green…….. 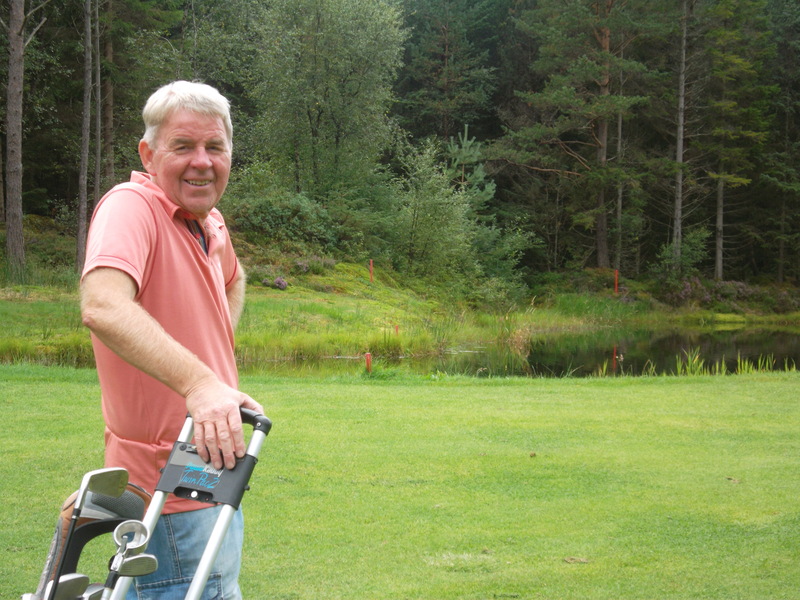 This weeks featured member is norwegian Jan Holdhus who can often be found on the range practicing his skills. He goes orienteering in the surrounding mountains, and loves skiing near to his cabin in Voss. He lives overlooking the fjord in Bergen and is glad to come to Condado to get away from the rain! Jan on a sunny day at his home course in Bergen….. 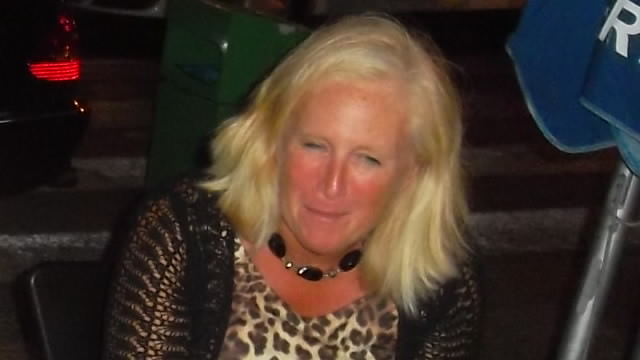 In the video are Karin & Torkild Dahl and Lynda & Colin Lloyd. Next week I hope to post a video challenge of ‘Delilah’ between Dave Lloyd and an alternative version from his friends who think they can do better! Here is this weeks joke which has a new year resolution theme…..
Jan & Eli Holdhus on the browned off 9th fairway while the greens staff water the rough in the background………..
We were fortunate today with the weather, sunshine in between the rains of Thursday and Saturday. 43 players and a good entry of 12 players for the ladies section. Dave gets yet another winner’s prize……. Kev back on form again…………. Alicia completes the trio of multiple winners………. 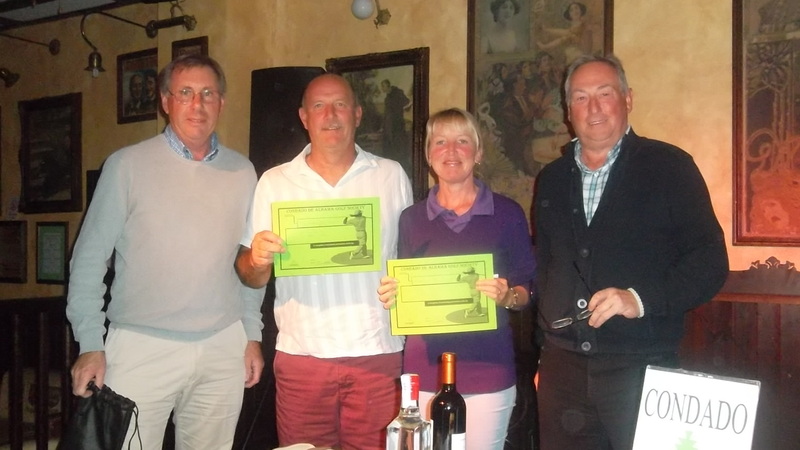 Next week is a pairs aggregate competition……pick your own partner and both your scores are added together………. Entries for the Anniversary Trophy are going well with over 40 entries so far. Tickets for the evening presentation at the Condado Club will cost 10€ with pie, peas, mash and gravy, entertainment from Neil Diamond and free tickets for a raffle and stand up/sit down bingo. The winners of these prizes will also be entered for an ‘open the box’ competition where all will be given a key to open the box for a cash prize. The unlucky keyholders will also get a lucky bag. 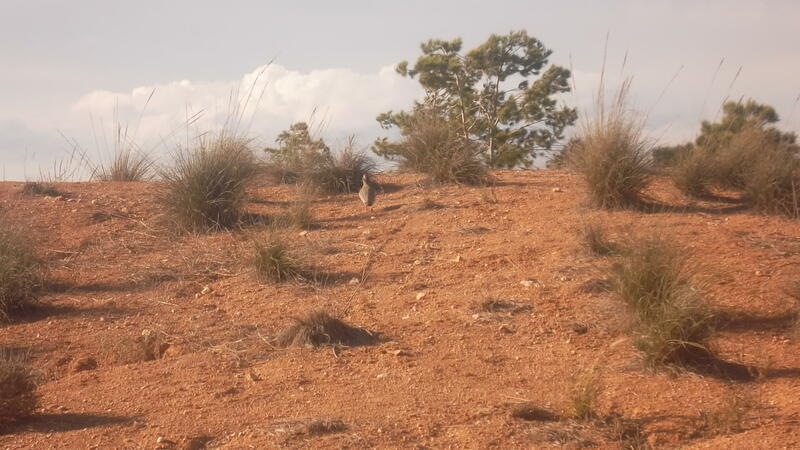 On my way off the course I disturbed a family of grouse (about 10 of them) who were sat under a bush alongside the 10th fairway. This week we have a video for you. Dave Lloyd doing his own take on the Aldi advert – ‘I like this, but I like this as well’ where they say their brand is better than more expensive options. It may look easy but it is extremely dangerous so don’t try this at home! I will post offers from local courses when they are available. Here is one from Lorca who often give good deals. Heavy clouds blanketed the course at the start of play, and it was very dark over Totana but fortunately the bad weather kept away. Along with a stiff breeze the conditions were not ideal for scoring. 44 players formed 11 teams, and in the finish it was the husband and wife teams of Myers and Currie who came out on top. Next week’s competition is an individual stableford. An entry sheet is now on the board for the first major of the year, the Anniversary Trophy. This will be played on Friday February 7th, and partners and times will be drawn on Wednesday February 5th. If you want a buggy please indicate it on the list or inform a committer member. This years plum polo shirts are now available at 15€. Diaries are also ready to be collected in the Clover bar. This week’s featured golfer is Pat Hughes, who hails from Dumfries (Scotland) and is the current holder of the Barry Answer trophy. Pat has been a regular player since the society was formed………. It’s a quiet week so here is a joke. Just as he was about to put the ball into the hole he was hit in the head with a golf ball that knocked him out cold. When he came to a few minutes later, he looked around and saw the deaf mute sternly looking at him, one hand on his hip, the other hand holding up four fingers. During the next few days watch out for Dave Lloyd’s hilarious video……..’mother’s milk’. For those who do not yet have a fixture list/diary, the full calendar for society events for 2014 is under the ‘fixtures’ tab. Please collect your diary from the Clover next time you are at Condado . They are free for members!